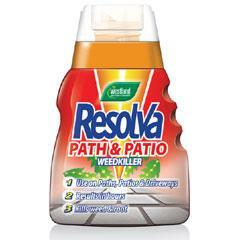 Resolva Path and Patio weedkiller is the latest Resolva weedkilling creation. It is ideal for removing weeds that attack your paths, patio and driveway. Resolva Path and Patio weedkiller is ideal for: Quickly eliminating a range of annual and deep-rooted perennial garden weeds, including grasses, docks, nettles, dandelion, bindweed and many more. How to use Resolva Path and Patio weedkiller: It’s best to apply Path and Patio weedkiller on a calm day when weeds are actively growing and have a large leaf area to absorb the weedkiller spray. If it rains within 6 hours of applying the weedkiller then this could reduce its effectiveness and you may need to treat the weeds again. Animals need only to be excluded while the product is wet,safe when dry. No key features selected for the WESTLAND RESOLVA 24h PATH & PATIO WEEDKILLER CONCENTRATE. No quantity discount for the WESTLAND RESOLVA 24h PATH & PATIO WEEDKILLER CONCENTRATE. Be the first to submit a review for the WESTLAND RESOLVA 24h PATH & PATIO WEEDKILLER CONCENTRATE.